In the early days of the solar system there were numerous terrestrial quasi planets orbiting Earth following chaotic orbits and through which are thought to have collided and accreted with one another to produce the solar system we recognise now. Scientist know objects such as comets are affected near planets affecting their orbits and velocities. Orbits do not always remain the same. Scientists can run predictions on gradual changes to orbits, so we know Earth’s orbit will become even more circular (have less orbital eccentricity. The Moon’s orbit around Earth is increasing every year by 4cm as a result of tidal acceleration. Orbital Resonance is where two or more bodies orbiting another larger body, such as moons around a planet or two planets around the Sun, have orbital periods that have a gravitational effect on one another so their orbital periods use a time ratio. For instance, Pluto makes two orbits for every three of Neptune. Jupiter’s moon Io makes two orbits for every one of Europa and every four of Ganymede. Jupiter itself orbits the Sun five times for every two of Saturn. 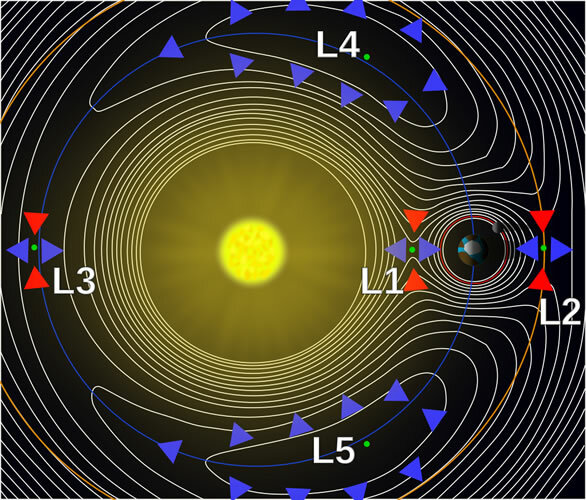 Lagrangian points are locations relative to two bodies where a smaller object can maintain a position in orbit. Positions L4 and L5 are the most stable. Asteroids known as Trojans follow and precede Jupiter on the same orbit at 60°. 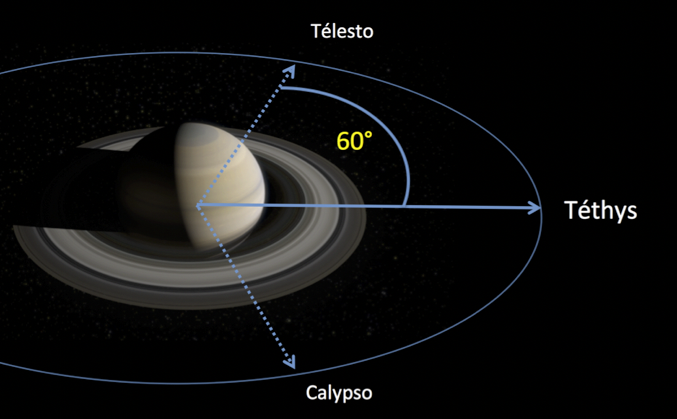 At Saturn there is a co-orbital configuration between the moons Tethys which shares an orbit with Telesto and Calypso located at 60° with respect to Saturn. SOHO observatory is currently located at point L1, GAIA at L3, STEREO observatories are located at L4 and L5 points as well as several others. NASA Science What is a Lagrange Point?